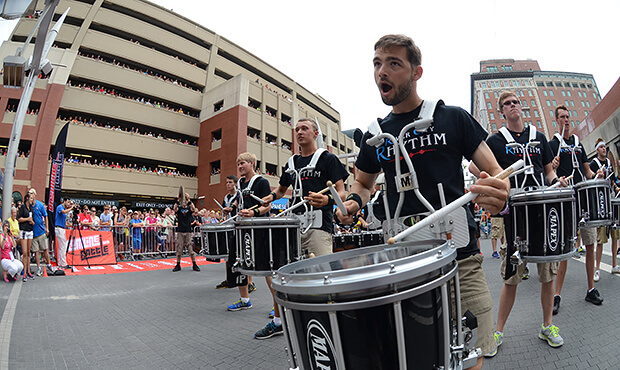 Spectators envelope the DrumLine Battle arena on Saturday, Aug. 9 in downtown Indianapolis. 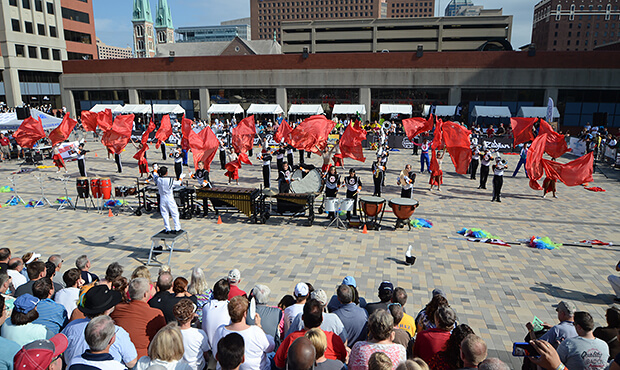 The morning of the 2014 DCI World Championship Finals on Saturday, Aug. 9, Pan Am Plaza in downtown Indianapolis was wide-awake and roaring with the sounds of two of Drum Corps International's newest performance programs, DrumLine Battle and SoundSport. First, the SoundSport competition took center stage as seven teams from all around the world met to throw down in the largest SoundSport event to date. With Indy's best gourmet food trucks lining the streets, the audience was able to enjoy the performances in a festival atmosphere. "We've got three different countries participating in this competition, a wonderful turnout from the crowd this morning, and a wonderful turnout from the teams," SoundSport and DrumLine Battle coordinator Eric Hjellming said. Each SoundSport team performed five to seven minutes worth of material for the large and enthusiastic audience and for a team of three judges. While SoundSport events are adjudicated, there are no numerical scores. Teams were evaluated in the categories of Music, Visual and Overall Impression with an emphasis on showmanship and audience engagement. Medellin Gran Banda finished with a Gold rating and 'Best in Show' honors at the SoundSport Indianapolis event. Participating teams in Indianapolis received feedback on their performances resulting in an overall Gold, Silver or Bronze rating given at the end of the event. GOLD Medellin Gran Banda – Medellin, Colombia Star United – Indianapolis, IN (Exhibition) SILVER Mon Valley Express – South Park, Pennsylvania Diplomats – Windsor, Ontario Cincinnati Tradition – Cincinnati, Ohio BRONZE Columbus Saints – Columbus, Ohio Medellin Gran Banda, the group that came to the 2014 DCI Tour all the way from Colombia, also walked away from their trip to Indianapolis with "Best in Show" honors. Medellin and several other groups also participated in SoundSport events in Huntsville, Alabama and Atlanta earlier in July, as the new performance program and ensembles were welcomed to select events on the DCI Tour. "From very humble beginnings last summer, SoundSport is now growing into a viable program for all kinds of different groups, from international teams to local startups to high schools, colleges and other marching ensembles looking for additional performance opportunities," Hjellming said. As the SoundSport events wrapped up Saturday morning on Pan Am Plaza, drum lines from Open and World Class DCI drum corps, international teams and independent groups from in and around Indiana began warming up for the second annual DrumLine Battle hosted in conjunction with the DCI World Championships. This mega battle event pitted teams against each other in a tournament-style bracket in order to crown the 2014 DrumLine Battle Champion. Members of the River City Rhythm drum line battle it out as spectators look on from all levels of a nearby parking garage. Like SoundSport, DrumLine Battle has also seen significant growth in its second year. The summer of 2014 featured more than 20 battles in stadiums across the country as part of select DCI Tour events that featured DCI drum corps in addition to other high school, college and independent groups. 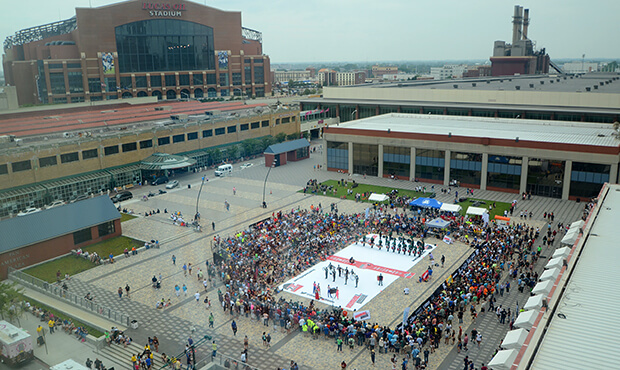 The DrumLine Battle in Indianapolis featured two performance arenas, one on Pan Am Plaza and a secondary stage on Georgia Street. In this urban environment, onlookers found just about any location they could to follow the action including a seven-story parking garage that overlooked the battles on Georgia Street. Colts cymbal player Morgan Swearinger, enjoys Drumline Battle events because they put members in a new and exciting performance environment. "Being right in front of the people is a lot different than performing on the field," Swearinger said. "There's a lot more crowd interaction, and having everyone that close to you just increases the vibe. It's awesome." 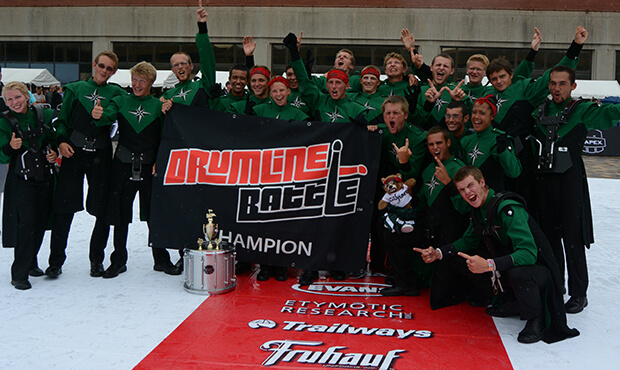 Members of the Oregon Crusaders drum line celebrate their win at the 2014 DrumLine Battle event in Indianapolis. Participating teams included River City Rhythm (Champlin, Minnesota), Ben Davis High School (Indianapolis), Center Grove High School (Indianapolis), Notre Dame College (South Euclid, Ohio), Medellin Gran Banda (Medellin, Colombia), McMaster University (Hamilton, Ontario), Patria (Quetzaltenango, Guatemala) and St. Mary's Drumline (Hamilton, Ontario), in addition to drum lines from DCI corps including Colt Cadets, Gold, 7th Regiment, Raiders, Racine Scouts, Jersey Surf, Oregon Crusaders, Colts and the Academy. After five rounds of competition, the Oregon Crusaders took on 7th Regiment in the DrumLine Battle Finals, out-drumming the Open Class corps to take home the top prize at the 2014 event. 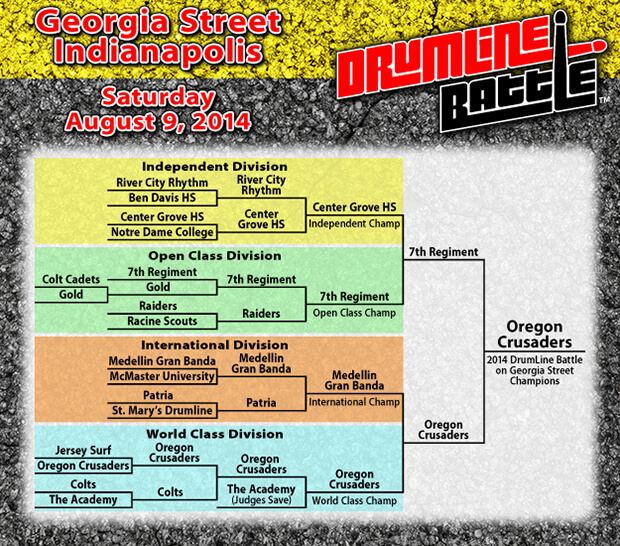 Though the 2014 Drum Corps International Tour has come to an end, DrumLine Battle will carry on through the off-season. Upcoming battles are slated for the Percussive Arts Society's annual Marching Percussion Festival on November 14 in Indianapolis and as part of the Florida Marching Band State Championships in St. Petersburg on November 21. Learn more about DrumLine Battle. Learn more about SoundSport.